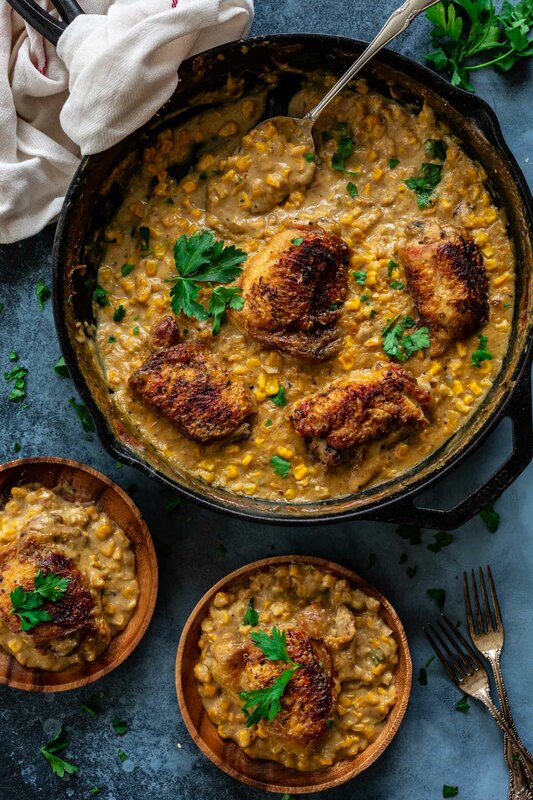 Made in one pan, this easy dinner dish consists of crispy chicken thighs that are cooked on a bed of velvety creamed corn! So easy, yet so flavorful. I guarantee you’ll be going back for seconds or thirds! I’m a little bit obsessed with this dish! I grew up eating chicken (usually breaded and fried) with creamed corn, so it really hits the spot for me, bringing a lot of comfort and nostalgia. In this version, everything is cooked in one pan, making it a great weeknight meal for busy families! But quick and easy doesn’t mean compromising on deliciousness, on the contrary! 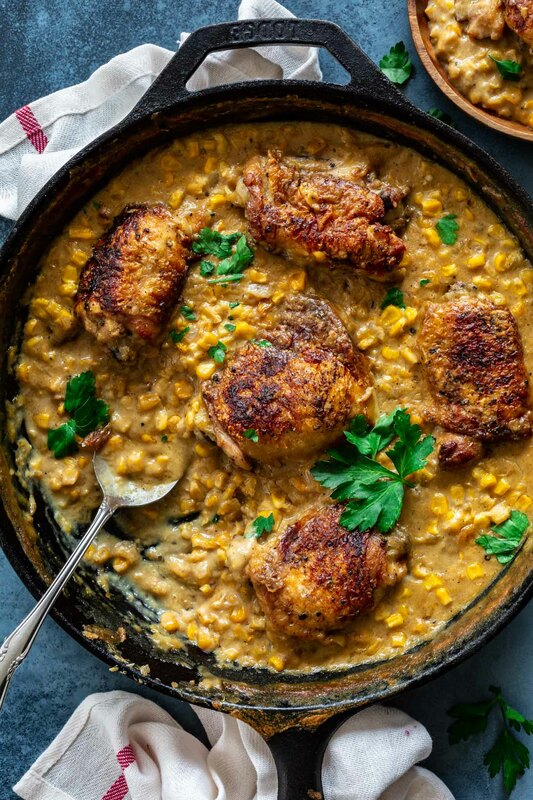 The creamed corn is cooked right after you finish browning the chicken thighs, so the chicken fat that rendered in the pan infuses it with lots of flavor. I know corn dishes are usually associated with summer, but since this recipe uses canned corn, you get to make this all year round! Which is very convenient, since it’s rich and comforting and therefore perfect for those chilly winter nights. The best way to make this is to cook everything in a cast iron pan and then pop it in the oven for the chicken to cook and get deliciously crispy. If you don’t have a cast iron pan, an oven proof skillet will do. Start by browning the chicken thighs and then make the creamed corn, using some of the fat that rendered in the pan. For the creamiest results, I like to blend milk with a can of corn and a cube of chicken bouillon for flavor. You’ll notice that I use 3 cans of corn total. Go big or go home, right? I don’t know about you, but I like my creamed corn to taste like corn and not like a bland creamy sauce with a few kernels here and there. After the creamed corn is ready, the chicken thighs come back to the pan and off to the oven we go, for about 30 minutes or until the chicken is crispy and cooked through, and the creamed corn is hot and bubbly! I’m not going to get into the endless debate between chicken breasts VS chicken thighs. For me, there’s a time and place for both of them! 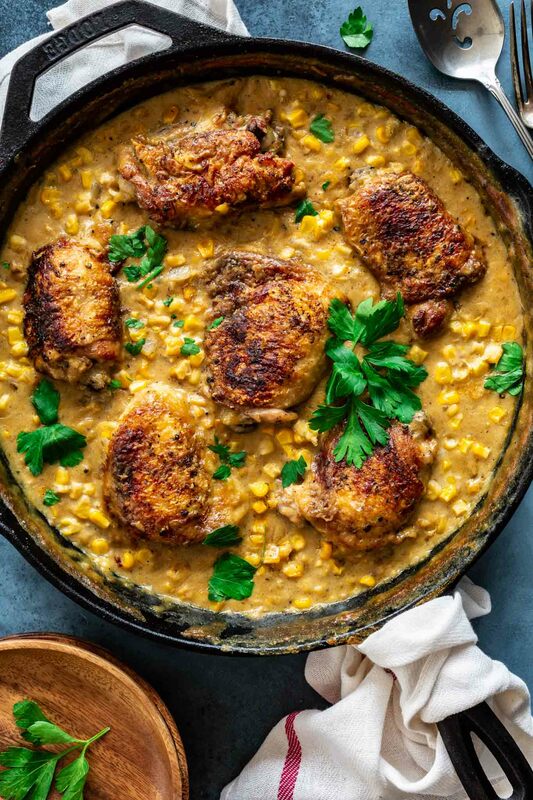 Now, for this dish, I think chicken thighs – which are a portion of the chicken leg, cut right above the knee – work better, because of their richer flavor, higher fat content (which will infuse the creamed corn) and more tender texture. When it comes to buying chicken thighs, you might get overwhelmed at the options. There’s bone-in with skin, bone-in skinless and boneless skinless. And while any of these would work for this dish, I highly recommend you use bone-in thighs with skin, especially if you like crispy chicken. The chicken skin also releases mouthwatering juices into the meat underneath it as it cooks, while protecting it from direct contact with the heat, therefore helping it retain its moisture. The results? Crispy juicy chicken that you can’t replicate with the other varieties! I know skin-on thighs can seem unappealing when you look at them in the market, but try to look past its looks and envision the final product! Believe me, that crispy skin is so worth it! Creamed Corn: canned, frozen or fresh? There’s something very soothing about shucking fresh corn, standing barefoot in the kitchen, in the summer. And while I love fresh veggies, I also love that I can get them canned or frozen when they are out of season! After all, corn is so tasty that you want to be able to eat whenever you fell like it, right? Thankfully, my creamed corn can be made with any kind of corn. If you’re reading this in the summer and have a bunch of fresh corn to spare, go ahead and make it with it, even better if you use grilled corn. Yum! But since we are in the middle of winter (I’m looking at snow flurries through my window as we speak! ), I’m focusing on canned corn for this recipe. Canned veggies usually get a bad rap, but they can be delicious and are very convenient. And canned corn happens to be my favorite canned vegetable! Whatever you do, please buy canned corn kernels and make the creamed corn from scratch. Opening a can of “creamed corn” and pouring it in the pan is not the same thing! If you make my creamed corn as written, I promise you won’t notice it is not made from fresh corn. 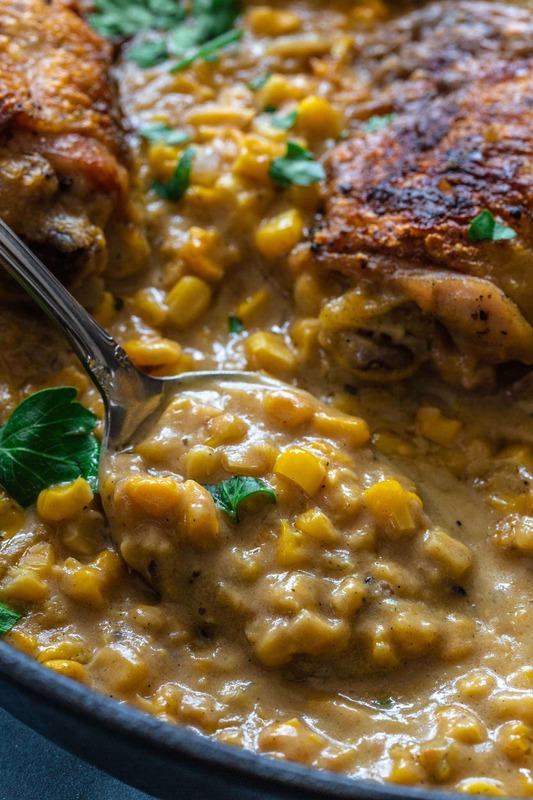 What to serve with Chicken Thighs and Creamed Corn? This one pan dish is a meal in itself! You really don’t need anything else as you already have chicken and creamed corn. That being said, if I weren’t watching my carb intake, I’d be tempted to serve it with rice. I just can’t resist fresh steamed rice soaking all the buttery creaminess from the creamed corn! A good crusty bread would also be a great call! In short, if you like chicken and corn – and who doesn’t? – this recipe is for you! I hope it brings you the coziness and comfort that it does to my family. There truly isn’t anything like sharing a great meal with the people you love. 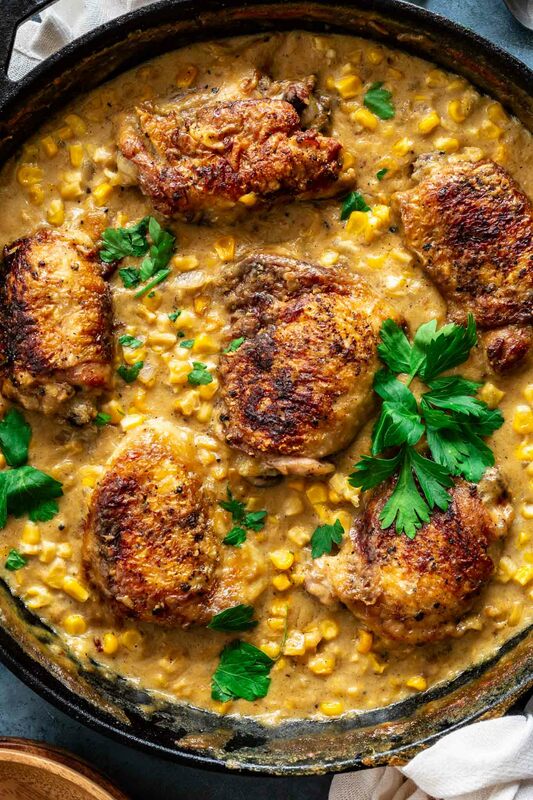 Made in one pan, this easy dinner dish consists of crispy chicken thighs that are cooked on a bed of velvety creamed corn! So easy, yet so flavorful. Browning the Chicken Thighs. Season chicken thighs with salt and pepper. 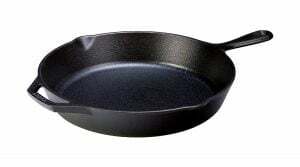 Heat the olive oil in a large cast iron pan (or oven proof skillet), over medium-high heat, until shimmering. Place the chicken thighs, skin side down, and brown for 2-3 minutes per side, until golden brown. Remove from heat and reserve. Prepare the milk. While the chicken thighs are browning, combine the milk, chicken bouillon and one can of corn (drained) in the jar of a blender. Blend until smooth. Reserve. Making the Creamed Corn. After you've removed the chicken thighs, lower the heat to medium and remove all but 1 tablespoon of the chicken fat. Add the butter and sauté the onion and garlic until fragrant and softened. Then, add the flour and stir, letting it cook slightly to get rid of that raw flour taste. Slowly pour the reserved milk corn mixture into the pan, stirring constantly, until thickened. Add the heavy cream, remaining corn, a pinch of salt and pepper, and parmesan cheese, mixing well. Taste for seasoning and adjust salt and pepper, if necessary. Remove from heat. Finishing in the oven. Return the chicken thighs to the pan, nesting them in the creamed corn. Transfer the pan to the preheated oven and bake for 25-30 minutes or until the creamed corn is hot and bubbly and the chicken is crispy and cooked through. You can pop the pan under the broiler for the chicken to get extra crispy, if you wish. Garnish with the chopped parsley and serve immediately!